Starting in tabletop, bring your big toes together to touch behind you. Press into your palms and send your hips down to your heels. Press your forehead into your mat or block for support. Allow your belly to rest in between your thighs. Stretch your arms long towards the top of your mat to feel both side bodies lengthen. Beginners Tip: If you feel any pain or discomfort, use a block or blanket in between the thighs and calves for support. If this pose is too straining on the shoulders or hips, close the legs together and release your arms to your sides for a modification. Come to all fours. Plant your palms firmly to your mat and spread your fingers wide. Feel your shoulders on top of your wrist and hips on top of your knees. Keep your knees separated hip width distance apart. Engage your belly muscles and create a flat surface with the spine by pressing your palms into the floor. INHALE – dip your belly down, chin reaches up, think about arching your back. EXHALE- Press palms into your mat, tuck your chin, feel the belly and pelvic floor lift. Beginners Tip: If you experience discomfort or pain by kneeling, use a blanket under your knees to help release pressure. 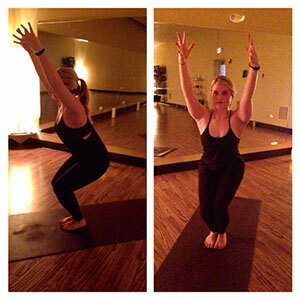 Starting in tabletop, begin to spread your fingers wide to your mat. Tuck your back toes under on your INHALE. Peddle out your legs to loosen your lower back, hamstrings, and calves. Press the arms into the midline of your body. Allow your head to relax by gazing at your feet. Reach your chest to your thighs as you lift your tailbone up and back. Beginners Tip: Think about pressing into the knuckles of each palm and the fingertips rather than the heel of the palm to avoid irritation to the wrist. Also, if you are tight in your shoulders, find a slight bend in the elbow to help relax the shoulders down and back. 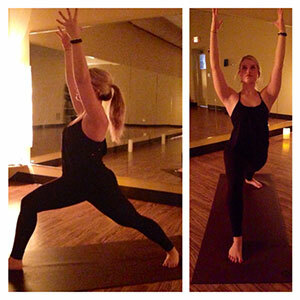 Start standing at the top of your mat, EXHALE- step one foot back into low lunge. Allow your hands to frame your front foot creating a 90-degree angle from your knee to your ankle. Spin the back foot down to a 45-degree angle so that the back foot is grounded to your mat. Press both hipbones forward while you draw the shoulders on top of your hips. Beginners Tip: The main focus of warrior one is to have both hipbones and shoulders facing forward. Bring your hands to your hips to help guide the hips to parallel. Stand at the top of your mat with your feet together. EXHALE- bend your knees, lower your hips, send the weight into your heels. Squeeze your inner thighs together as you extend your arms over head. Lengthen your tailbone down creating a flat surface at the base of your spine. Engage the belly as you reach your heart forward. Beginners Tip: Widen your stance by separating your feet apart to release tension on your knees.